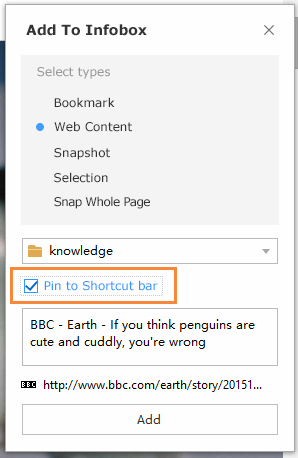 For those most frequent used content pin to Shortcut bar! 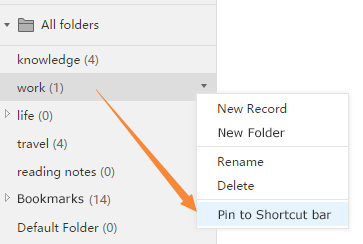 You could set a website, a note, or a whole folder to Shortcut bar to realize quick locate. After that, open your personal center-Infobox, Shortcuts show in the left column to ease your quick locate. 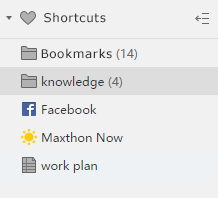 Open your Maxthon browser, the Shortcut bar shows the Maxnote's shortcuts immediately. By the way, the above two places can be dragged to change sequence! You can use search records to search for the related records by keywords. Q：How to pin to Shortcut bar? At the right corner of each record details click the heart button to pin or unpin. As for the whole folder, you can also pin to Shortcut bar like below. When you collect all information types, you can also pin it to Shortcut bar like below.